206 pages, 5.5" x 8.5"
Your fists are your primary weapon system in a streetfight, but most martial arts "masters" like to gloss over that fact. 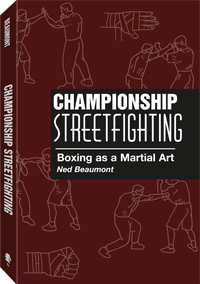 Now fisticuffs expert Ned Beaumont shows you how to duke it out in back alleys and smoky bars and walk away grinning (with all your teeth). All the dirty tricks of boxing are included, too. Not for the faint of heart, this one is destined to become a classic. Stickgrappler's Note: I am guessing the Paladin site will be shut down at the end of the year and I'm archiving select Paladin Press pages to my blog to preserve an essential part of martial arts from 1970-2017. Archiving some of my favorite Paladin titles. Paladin Press - Put Him Out!